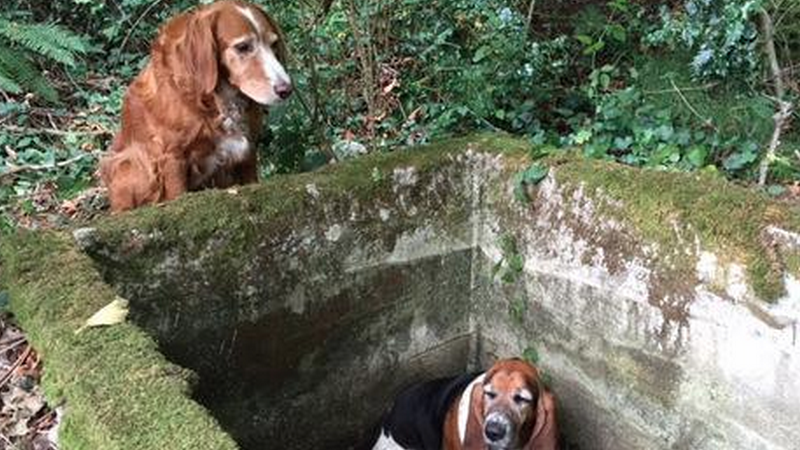 Tillie and Phoebe are two dogs who were lost for almost a week in the woods in Washington state. Phoebe wound up trapped inside a concrete cistern in a ravine and couldn’t get out, so Tillie would leave every day to go find help. She would then return to stand guard over her best friend. On September 14, Vashon Island Pet Protectors, an animal rescue organization helping with the search, received a tip. A “reddish dog” had come up to the caller several times before heading back into the woods, reports USA Today. Volunteers went out to the ravine and called out Tillie’s name. She replied with a single woof and was found lying beside the cistern with her head resting on the concrete wall. “Heart sinking...we knew that meant Phoebe was inside the cistern,” VIPP’s Facebook post reads. Phoebe had been standing on concrete rubble that kept her out of the water. Tillie and Phoebe were in good health, but hungry. They enjoyed a nice hamburger dinner when they returned home.